Winter Downs is first in the Bunch Courtney Investigates series. 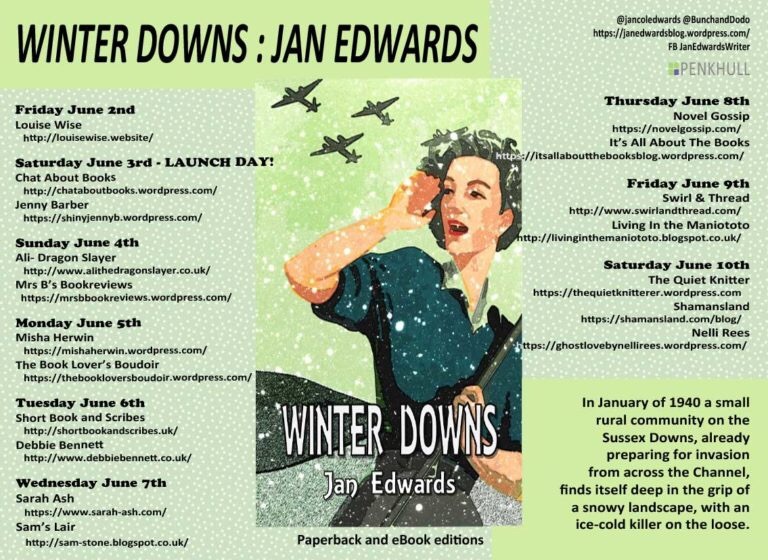 Welcome to my stop on the blog tour for Winter Downs. I have a Q and A with the author to share today. I don’t have a typical writing day, though I’d probably get a lot more done if I did! My best writing time is the wee small hours between 11pm and 2 am. It’s a habit I developed when my kids were small and it was the only time of day when there was a modicum of quiet. Oddly I can write using the laptop in front of the TV or play music when I write to create white noise. I am too easily distracted; usually in researching tiny details that I can’t write past. I have to know if X brand of toothpaste was available in 1940. Or what the applicator in a 1930s handbag powder compact was made from. These things intrigue me and I’m a mine of totally useless information. I began writing my own stories when I was till at infant school. I suspect that was down to living in a very rural area that lacked a library to pillage and because I was sick a lot so writing relieved the boredom of long spells in bed. I once spend several weeks (aged around eight years old) being a character in a book I was trying to write and referring to myself in third person. My father had explained why some books were first and some third person – yes I was that child with the constant ‘why’ on my tongue – and as the whole concept fascinated me I had to try it out for myself. The family were highly amused and it took me years to live it down! 3. Who are your favourite writers/inspirations? Always a tricky question because I read anything and everything until I was well into my teens. Only then did I start to gravitate more toward crime/horror/fantasy, and that due mainly to my abiding passion for folklore and myths. I grew up on a diet of Enid Blyton and Arthur Ransome and abridged classics. I came across Michael Moorcock’s science fantasy in 1969 and was blown away! It was such a new concept to me at the time. Other authors? Jane Austen, Daphne Du Maurier, Raymond Chandler, Agatha Christie, Dorothy L Sayers et al. I love Peter James’s fiction and a zillion other modern crime writers but I have also always read classic crime by the bucket load, which has influenced the whole process of dreaming up and writing Winter Downs, which is set in 1940. I have always been an advocate of the Stephen King school of writing in that I don’t plot too closely. That way I am as surprised as the reader when things happen. Crime, especially whodunnits, are a little different because the clues have to be there for a reader to pick up on. I still write from the gut but make sure that those clues are all there in the rewrites. Likewise characters can develop by osmosis. In Winter Downs, for example, the main characters were meant to be Bunch and her sister Daphne (Dodo). But when Chief Inspector Wright walked on stage he just failed to leave and Dodo got shoved into the background just a little. Wright was just the perfect foil for Bunch and I really had no option but to give him some room. 6. On average, how long does it take you to write a book? It’s that proverbial piece of string! First draft for Winter Downs took just a few months. The far harder and longer part came with the editing. 7. What’s the best compliment that you’ve received about your work? A recent review for my Leinster Gardens ghost story collection said: “I thought Nanna Barrows (was) my favourite, until I read R for Roberta, then I changed my mind again when I read Redhill Residential, then The Clinic, then Wade’s Run…” It was humbling to have a reviewer be unable to pick a favourite. But it was the late and very great Tanith Lee that made me blush. She was kind enough to read my short story collection Fables and Fabrications and called it a …fascinating and engrossing read that is subtle and elegantly elusive. High praise from the Queen of dark fantasy! 10. If writing wasn’t your career what would you be doing? Who knows? I’ve already tried my hand at so many things. I was a Master Locksmith for 20 years but also been a bookseller, microfiche photographer, stable girl, sold motorcycles, grown house plants, worked as a lab technician and been a librarian. Currently in addition to being a writer I am a practising Reiki Master. 8. 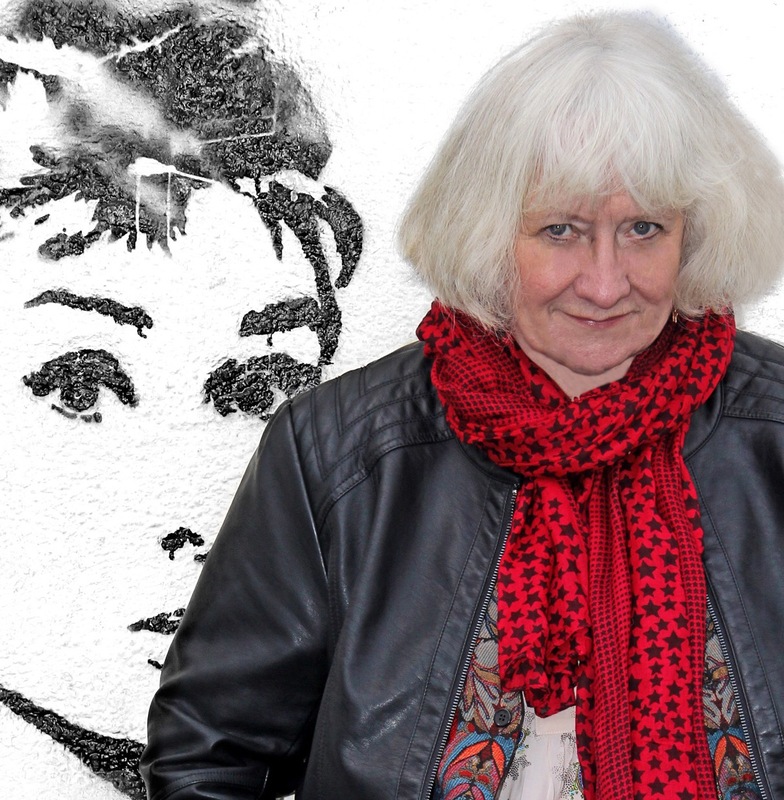 Favourite character from one of your own novels? I have a noir cosmic horror character Cpt Georgi, very much in the Agent Carter mould, that I write about in short fiction now and then. When it comes to my Holmes stories I always have a soft spot for Watson. I am exasperated by some of the TV and Film versions where Watson is portrayed as a buffoon. In the books he was far from being that. Yes Holmes may appear quicker on the uptake when it comes to analysing the evidence but he is a genius and faster than everyone (with the possible exception of Mycroft). But Bunch Courtney is my favourite. She is often frustrated by the restrictions placed in woman of that era and fully intends to take advantage of the opportunities that the circumstance has to offer. She is in control of her own destiny throughout Winter Downs and I am looking forward to following in her wake in the next two novels already in planning and beyond. 9. Preferred method for readers to contact you? Reblogged this on Misha Herwin. Re-blogged on Misha Herwin. 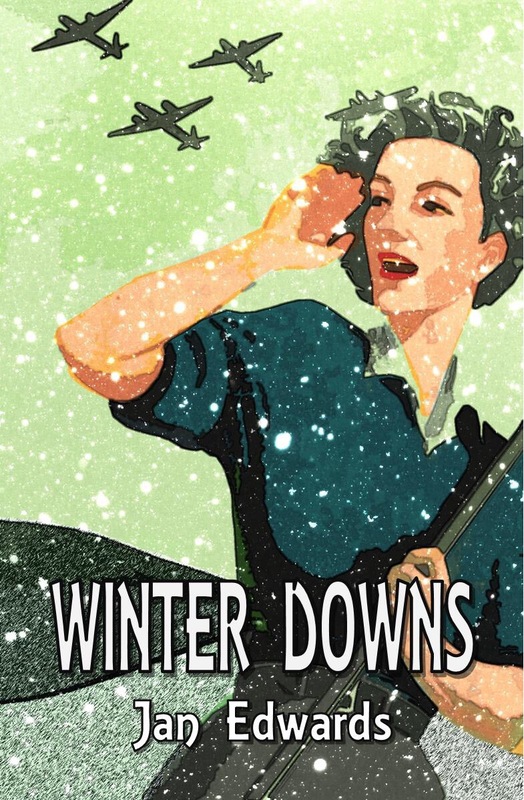 Winter Downs is a great read and I’m looking forward to more from Bunch.